British and German troops meet in no man’s land. Boxing Day, 1914. Photographed by 2nd Lt Cyril Drummand, RFA. 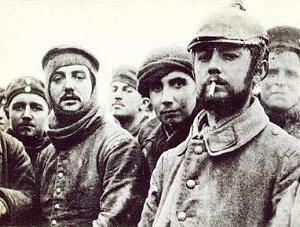 The Christmas Truce has become an enduring image of the triumph of man’s spirit over adversity. On December 7, 1914, Pope Benedict XV suggested a temporary hiatus of the war for the celebration of Christmas. The warring countries refused to create any official cease-fire, but on Christmas Eve the soldiers in the trenches declared their own unofficial truce. Late on Christmas Eve 1914, men of the British Expeditionary Force (BEF) heard Germans troops in the trenches opposite them singing carols and patriotic songs and saw lanterns and small fir trees along their trenches. Messages began to be shouted between the trenches. The following day, British and German soldiers met in no man’s land and exchanged gifts, took photographs and some played impromptu games of football. They also buried casualties and repaired trenches and dugouts. I received your letter yesterday pleased to say. I am keeping fit and well. We are having very trying weather but are looking forward to the spring. The Battalion has had a very rough time of it up to this present as I dare say you have seen by the papers. I am sorry to say I have not received Fred’s parcel. I have had 5 parcels sent out that I know of and have only received one. We had a funny experience this morning. Firing became slack and we had the order not to fire unless the Germans fired. Soon after one of the Germans got out of their trench and called to us to go half-way (our trenches and theirs are about 150 yards apart in places). About a dozen of us went forward and soon all our chaps were out of the trenches shaking hands with the Germans and exchanging cigarettes. One gave me some cigars and biscuits and as I had nothing else handy I gave him Fred and Gert’s Christmas Card as a keepsake. You might tell Fred and Gert when you see them that their card will travel further than they expected. Must close now as I have not much time. Hoping you and Nelly are keeping well and wishing you both a Happy and Prosperous New Year. This entry was posted in Parables and Stories and tagged Christmas Truce, WW1. Bookmark the permalink.